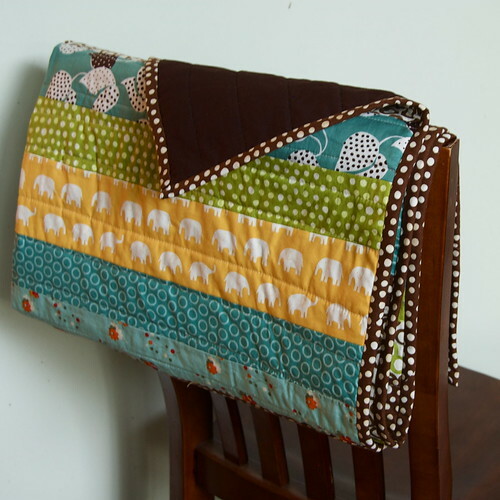 ﻿ Dog Named Banjo » A new quilt! I made another quilt! This one is for Melinda & her family, who received it the other day. Now that she has it in her hands, I can show it to you! It’s a strip quilt made from lots of colorful polka-dot fabrics, and also includes my favorite Elephant fabric plus some Flea Market Fancy that I’m surprised I still haven’t used up after all this time (though, it’s on its last legs to be sure, heading into “scrap” status at this point). Melinda’s family includes two adorable children. I’m hopeful that the kids find this quilt’s colorful disposition not quite as blinding as I do, and instead find it to be fun and joyful instead. 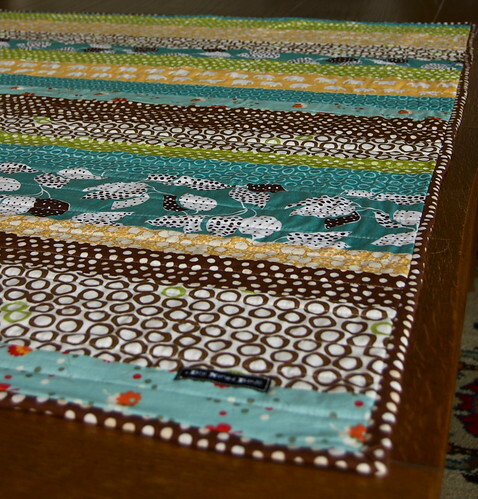 I’ve got a few more projects on the docket, but I’m laying off the polka dots for a while for the next up. Holy crap that is awesome!! You are the second person this weekend to fuel me on to start my quilt!! It’s the perfect weather for crafting – pouring rain and super foggy. .-= Jabba´s last blog ..Grouch =-. Holy cow–that is AMAZING. I love the fabrics and colors you chose! 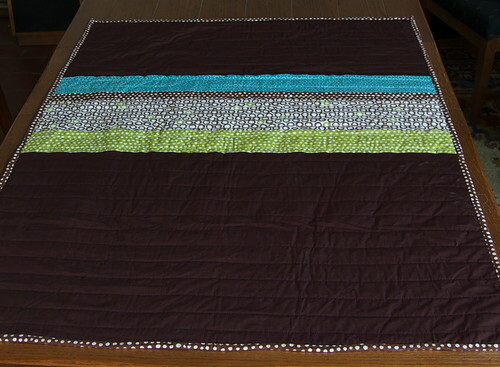 .-= Traci´s last blog ..up next – a tablecloth for the kitchen table =-. oh gosh, it’s SO great!!! I love love love the colors so much!!! .-= Amanda Elizabeth´s last blog ..Hi There =-. Wow, I just love your Blog, have never really read one before. Found yours while researching for my new Bernina 440 qe , and after i bought it, your instructions are much easier than the manuals and the pics are the best, keep writing, cant wait to see what you do next. So dotty! So happy! I love it! .-= Hashi´s last blog ..More gifties =-. Let’s see… lots of fabrics to name. There are some elephants by Daiwabo, a few teal patterns from Denyse Schmidt’s Flea Market Fancy, and some Monaluna Mingle, I think. The only one I dont’ really know about it the yellow one that isn’t elephants. Not sure where that one came from!